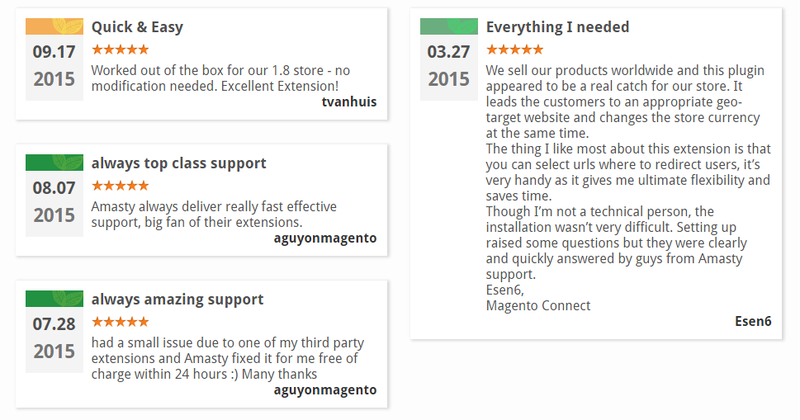 If you are going to expand your ecommerce business to other countries (or already work with foreign customers), the Amasty Magento 2 GeoIP Redirect extension is a must-have tool for your Magento storefront. The module provides international visitors with the ability to shop seamlessly due to automated multi-language, multi-currency, and multi-store functionality. It automatically changes appropriate parameters depending on a visitor’s location. Thus, you eliminate the need to create separate websites for foreign clients. Below, we describe the Magento GeoIP store switcher in more details. Now, we will describe the extension in a more detailed form. The core feature of this Magento 2 GeoIP Redirect extension is the ability to guide visitors to a specific store view. The tool determines a visitor’s location and redirects him or her to the correct version of your ecommerce storefront. As a result, you show localized information in the familiar language, significantly improving the shopping experience. Besides, the Magento GeoIP store switcher uses GeoIP technology to change price currency to the one which is used in the customer’s country. Along with the language, both are adjusted automatically. At the same time, you can easily avoid unwanted store switching for search engine spiders and user agents. Note that Google, Yahoo, and Bing are already ignored by default in the settings of the Magento 2 GeoIP redirect extension, but you can specify some additional engines. Besides, Amasty GeoIP Redirect for Magento 2 and 1 provides the ability to redirect customers from the home page only. The feature is very useful in case users may need to see particular pages of your store in their original form. Alternatively, you can restrict redirection for particular URLs. The Magento 2 GeoIP redirect extension also allows redirecting users for each new visit or displaying the new store view only for the first one to let them know that there is support for multiple languages and currencies. As for redirects to specific URLs, you can fully leverage this feature to guide your visitors to a particular store page, blog, or even YouTube channel. If you don’t deliver some items to specific countries, you can redirect customers from these regions to a page with some additional information or useful advice about how they can get the desired goods. You can configure the Magento GeoIP store switcher under Stores -> Settings -> Configuration -> Amasty Extensions -> GeoIP Redirect. All settings are divided into 5 sections: General, Restriction, Country to Store View Redirect, Country Currency Switch, and Country to URL Redirect. In the General settings of the Magento 2 GeoIP redirect extension, you can enable/disable the extension. As for Restriction, this section provides the ability to decide how to apply the logic of the extension: Specified URLs (a new ‘Accepted URLs’ field appears), all URLs except specified (another new field – Excepted URLs), or redirect from home page only. Next, you can enter user agents and spiders that the module will ignore. Besides, the Magento GeoIP store switcher lets you specify restrictions by IP. 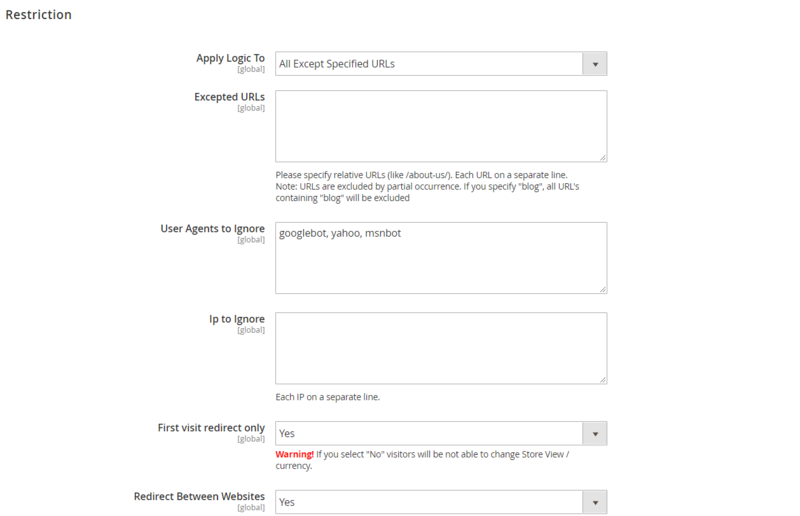 The last two options allow enabling/disabling such features as ‘First visit redirect only’ and ‘Redirect Between Websites’. Country to Store View Redirect lets you enable the corresponding feature. As for Country to Currency Switch, this section of the Magento 2 GeoIP redirect module not only allows you to enable the feature but also provides the ability to specify country to currency mapping. The same is about Country to URL Redirect: the Magento 2 GeoIP redirect extension allows activating the feature and linking countries to specific URLs. 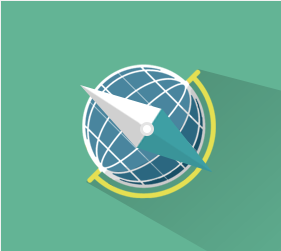 Amasty GeoIP Redirect for Magento 2 and 1 is a simple solution with a necessary functionality. The tool fundamentally improves the default Magento shopping experience making your foreign customers more satisfied with your storefront. As for the price of the Magento 2 GeoIP redirect module, it depends on the Magento version you use. The M2 tool costs $179, while the M1 extension’s price is $89.